Welcome to Day 3 of the JavaFX in Spring blog series. In this post we are going to finish off the Customer Data application by taking advantage of the Spring Security APIs on the client. On the left is the Austin JUG, which is a large, well-established user group and on the right is the Houston JUG, which had a unique venue with personal monitors for all the attendees (this would be a great setup for a lab in the future!) I posted the talks on Hacking JavaFX with Groovy, Clojure, Scala, and Visage and JavaFX 2 – A Java Developer’s Guide to SlideShare so they can grab the full presentation decks. Getting back to the JavaFX in Spring example, in the last blog we covered Spring configuration of a JavaFX app to modularize the screens. As a simple example we did an error dialog to show how FXML ties in, but now let’s create a login page to demonstrate using Spring Security for Authentication. The important part for authentication is taken care of in the login method. This grabs the username and password from the respective fields and creates a new UsernamePasswordAuthenticationToken. To force authentication to take place immediately, we get autowire a reference to the Spring AuthenticationManager and call the authenticate method. If the user exists in our credential store the method will succeed, otherwise it will throw an AuthenticationError we catch in the enclosing try block. This sets up two different users and two roles. One is our manager who will have full access to the system and a laughably weak password, and the second is the employee who will only only have access to create new customers, but not delete. We are going to take advantage of these roles to secure the customer creation and deletion routines using annotation-based authorization. Jar Explosion – I tried to be minimalistic in my inclusion of dependencies, but still ended up with dozens of jar files for this example application. This may be an issue if you are deploying to resource constrained devices or over a thin network pipe, but for packaged applications should not be an issue. All Permissions Required – Since Spring makes heavy use of aspect-oriented programming (AOP) libraries that manipulate bytecode, you won’t be able to run this application in the Java sandbox. The best approach is to request all permissions and code sign your application so the end user just gets prompted once. AOP Glitches – In your own applications you will trip across various little quirks with AOP and bytecode manipulation that can make client programming quite hazardous. For example, if you put an @Secured annotation in a UI class file loaded in the main thread, you will get a ClassCastException on the proxy. It is possible to get the target class out like this, but it is nefarious enough that it bit me in a live-coding presentation. Hopefully you have learned a little bit through this tour of JavaFX and Spring integration. I would love to hear what other folks have been doing to integrate these technologies in the comments section below. Update: I have added in some references to WidgetFX 1.2 tutorials below. We are proud to announce the 1.2 beta release of the WidgetFX framework. JavaFX 1.2 Support – You can finally take advantage of all the new features of JavaFX 1.2, such as Controls, Layouts, and Charts in your desktop widgets! Built-in Layout – Widgets now have an onLayout() function that can be used to layout the top-level nodes. Improved Performance – The widget dock, as well as all widgets will benefit from performance improvements in the framework. 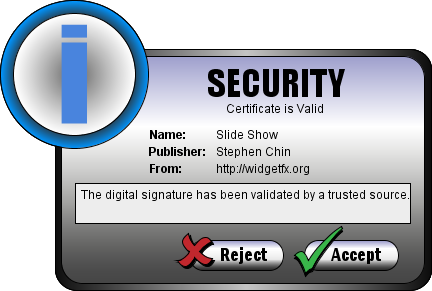 Signed Widgets – Widgets can now be signed with certificates to get out of the sandbox and gain access to system resources. We will be adding more goodness before the official release, but wanted to get the major features implemented that would have API impacts on widget authors. Any changes from this point will be API compatible with the final 1.2 release. IMPORTANT: If you are an existing WidgetFX user, please delete your widget configuration prior to launching the new dock. This will ensure that the 1.2 versions of the built-in widgets will be loaded. Your widget configuration directory is under $USER_HOME/.WidgetFX.